What is IF frequency for 2000669 ? Is it a direct conversion on SW with a zero (audio)IF or low IF around 12 kHz ? Would like to add a BFO. The models shown here are what are known as “Software Defined Radios”. They use a VCO under control of a DSP processor and convert the signal to a low frequency or even base band. The DSP engine inside the chip then applies decoding as needed so there is no need for a BFO or a PLL or Stereo Decoder. They interface the low frequency output of the mixer straight to a set of A/D converters that are set up in an I/Q format. One signal for one mixer is 90 degrees off from the other. 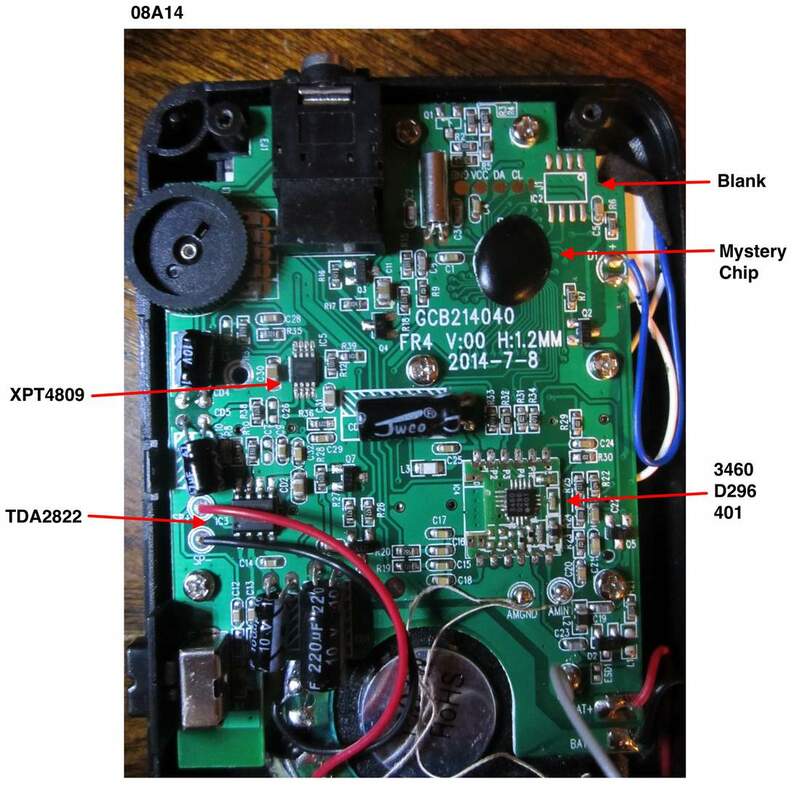 Would anyone here know how to modify the internal components in order to continuously sweep through the channels unmuted; picked up this radio in hopes of making a spirit box for ghost hunting, but unfortunately can’t make heads or tails of this model. The mystery chip may be a bare die PIC processor of some sort and IC2 is wired for a serial flash chip (24C01 through 24C32). I suspect the PIC, possibly a 16F or 18F family, as this is perfect for controlling an LCD and has an SPI/I2C port to control the Si4734. The 32K clock this card uses is supplied by the CPU and I think that’s why it’s not installed. Why waste a good crystal? This is important as the DSP radio inside the Si4734 is outputting in stereo. K.U., thanks for the info. Looking at the data sheet, this chip has a lot of capabilities not implemented in this radio (too bad). Maybe a hacker’s challenge? Still, for the money, I’m happy with it: it has become the radio I listen to every morning while walking the dog.